His only opponent is a good (yet extremely tough) guy named Lino Dupree (David Belle) who is hell bent on stopping Tremaine and keeping drugs out of his neighborhood. Everything made up of bricks isn’t always rock solid. “Brick Mansions” proves that. The action film starring the late Paul Walker is a remake of the 2004 French film “District 13”. 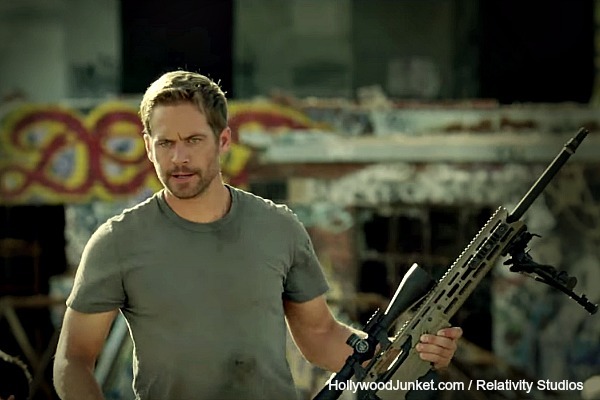 In it Paul Walker plays Officer Damien Collier from Detroit. It’s a few years into the future and things have got even worse for inner city Detroit. I’m talking from “I got shot” bad to “I got shot and there’s no hospitals” bad. The government has decided to build walls around this area to keep people from going in and out and then to save money also decided to stop funding the basics such as hospitals, police, schools, etc. The poor area now known as Brick Mansions is basically being ran by a major drug dealer named Tremaine Alexander whose played by RZA (of the world famous Wu Tang Clan…More on that later). This guy is basically the wealthy king of a drug infested and broke down castle. His only opponent is a good (yet extremely tough) guy named Lino Dupree (David Belle) who is hell bent on stopping Tremaine and keeping drugs out of his neighborhood. This street smart and talented fighter is played by David Belle who actually starred in the original French film as well. The good part of this film like most action films is indeed… You guessed it. THE ACTION. You can tell Paul Walker put forth 110% into nailing these brilliant and jaw dropping Parkour and Brazilian jiu jitsu moves. This style of movement and fighting is new to American audiences and Paul Walker was proud to introduce us to it in the best way possible. Having one of the eight founders, creators of the Parkour movement in Belle, helped tremendously and although he was retired from action films before this you could not tell at all. The 40-year-old moved around in this movie like a 20 year old Jackie Chan. The bad part of this movie was the dialogue. Terrible and cliche dialogue ruined so many scenes for me. The dialogue was so over the top during a very pivotal part of the movie Tremaine, played by RZA (Wu-Tang Clan), emphatically states “Where I’m from cash rules everything around me.” You don’t have to be a huge Wu-Tang fan to get that reference from one of their most famous songs ‘C.R.E.A.M.” which stands for Cash Rules Everything Around Me. This quote and many others caused the entire audience to groan and chuckle during moments that were meant to be intense. Dialogue distracting from the action and having the opposite effect it was meant to have on a scene is never a good thing. Some of this may belong to Luc Besson and Bibi Naceri who wrote the screenplay. Some may also belong to the actors which brings me to my next point. How do I say this nicely?!? The acting wasn’t very good. With the exception of the leads Paul Walker, David Belle, and at times RZA the rest of the cast was terrible. For instance, Tremaine’s main employees named Big Cecil (Kwasi Songui) was supposed to be a frightening figure but most of the time was laughable. Again part of that was the dialogue’s fault but not all of it. Do I also blame the director Camille Delamarre who clearly also directed breath taking actions sequences. I don’t know. There were some decent supporting jobs done by Ayisha Issa and Catalina Denis who played Rayzah and Lola respectively. Although the two women who verbally and physically battled throughout the film did share in some very cliche girl fighting moments they did well with what was given to them. Can’t say the same for the supporting men. 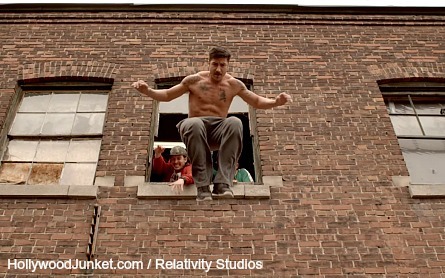 Pictured: David Belle in action! I commend Paul Walker on trying to bring this new style of action to American audiences and one of his last performances as an actor was very good. Seeing what he could do with a different kind of films makes me wonder what else he was capable of and how much he could’ve achieved if he were still here. I just wish I could give the same kudos to everyone else and the film as a whole. Unfortunately I can not. If all you want to do is see Paul Walker and watch a few people get beat-up in cool ways go for it. Otherwise I’d suggest you stay home. “Brick Mansions” opens in theaters on Friday, April 25, 2014.